Old Brodleians will travel the short distance to Standeven House, Halifax, to take on newly-promoted Old Crossleyans for their second local derby of the season on Saturday afternoon. Crossleyans have been flying high and are top of the table with five consecutive victories after an excellent start. Brods will travel with confidence following their latest performance against Dinnington two weeks ago. The much-improved effort was particularly highlighted by the reduction of penalties conceded, and that discipline will be needed against a top of the table side brimming with confidence. Brods will be without Joe Armitage as he is holidaying in Dubai. Club captain Rob Jennings will not be available after undergoing his long-awaited knee operation. Old Brods will welcome back Alex Dawson and Cameron Wroot to the pack following their recent unavailability while Harris Morris will likely be in the squad following his recovery from injury. He had picked up a knock in the defeat at Bradford Salem last month. On his return to Brods, following a spell at National League side Huddersfield, Callum Thompson will bolster the pack. It will no doubt be an intriguing contest up front in what has always been a traditionally hard-fought fixture. Old Brodleians coach Ollie Akroyd expects to have some “interesting” selection dilemmas this month. Thompson has rejoined the club from Huddersfield and fellow prop Bennie Pritchett is expected to be back from America. Scrum half or utilty back Charlie Rigby, curently studying in Leeds, has joined from National South club Tunbridge Wells. That is just the tip on the iceberg, however, as Akroyd explained. Crocs rugby chief Howard Cooper is expecting a difficult afternoon, tipping the derby showdown as the club’s biggest test of the season so far. “The fixtures have been kind to us so far with four of our first six games being at home, and despite much-fancied Middlesbrough already having visited us we view this coming Saturday as our toughest test so far,” said Cooper. “We are confident that we can continue our run of good results, who wouldn’t be with five wins from five, but complacency won’t be a factor. 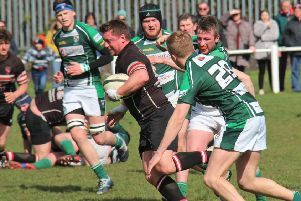 “Any team that beats Beverley and Dinnington so comprehensively have to be respected. “There were aspects of our game last time out at Selby that we were disappointed with and coach Gareth Greenwood has been working hard with the lads in training to put right, but these are areas that weren’t a problem up to that game so there is no cause for alarm. “As normal at our level of rugby these days we have a couple of players unavailable, but we have to manage this and the lads taking their spots are all capable players. “It makes me laugh when I read reports from clubs moaning about having a weak side due to unavailabilities and using that as an excuse for losing.